Notre Dame’s Katie Dettwiller was held to six points during Saturday’s 34-27 loss to Waynesville. Ava Hassel led Notre Dame in scoring Saturday with nine points. The Titans fell to Waynesville, 34-27. IRONTON – If you’re going to lose, it’s better to do so when it isn’t a win or go home situation. Notre Dame is undefeated no more, but the Titans’ season is still extremely alive and well. Falling 34-27 to Waynesville, the AP’s No. 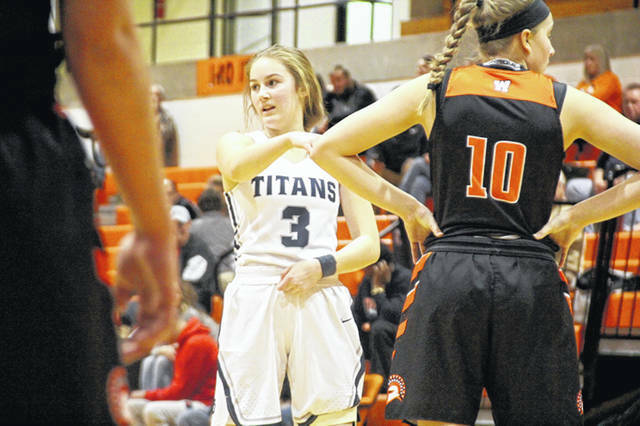 4 ranked team in Division IV, at Ironton High School Saturday, Notre Dame (16-1) savored their first taste of defeat this season. But the lessons learned from the loss may prove to be vital down the road. The Titans were superb on defense, holding the Spartans (16-0) to just 25 percent shooting. But they also turned the ball over 22 times which was, as McKenzie said, the difference. “The girls hate this right now. But I think going forward, this could be a blessing for us,” McKenzie said. McKenzie said Waynesville was the best team his Titans have faced this season, both offensively and defensively. The Spartans held lived up to that billing, holding 6-foot-4 center Katie Dettwiller to just six points. With Dettwiller unable to score, Notre Dame’s offense hit a lull. One positive … a continuing positive … was the play of guards Isabel Cassidy and Olivia Smith. Cassidy hit two huge 3-point field goals while Smith played a good floor game, distributing the basketball well and crashing the glass. Dettwiller gave the Titans their first lead, at 4-2, with 5:35 left in the first quarter. That was in the middle of a 9-2 run to begin the game. But Waynesville cut the lead to 9-8 heading into the second. Dettwiller scored again with 5:11 left in the first half, giving Notre Dame a 12-7 lead, but the Spartans answered again, going on a 7-2 run to end the half, forcing a 14-14 tie. In the third, the two programs traded the lead back and forth. Ava Hassel hit a 3 with 4:53 left, giving the Titans a 17-14 edge before Cassidy followed suit at the 1:04 mark, making it 20-19. But when Waynesville took a 21-20 edge with 10.3 seconds left, on a bucket via Lynzie Hartshorn, it marked the final time the lead would change hands. Cassidy hit another 3 with 6:29 left in regulation to cut Waynesville’s advantage to 25-23 but that was as close as the Titans would come to retaking the lead. 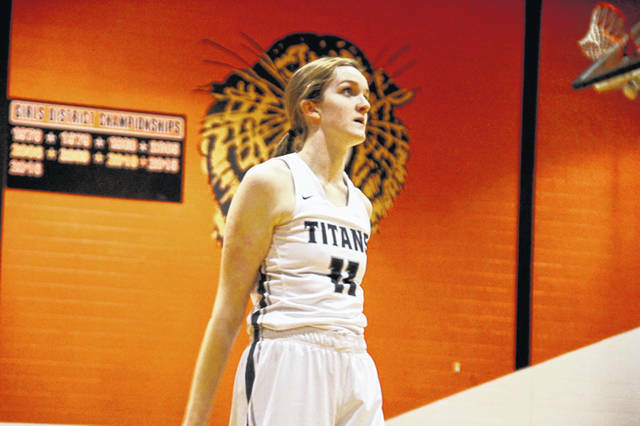 Statistically, Hassel led the Titans with nine points, six rebounds and two assists while Dettwiller added six points and a game-high 13 boards. Cassidy finished with six points, Hash had four points and six rebounds, and Olivia Smith added two points, four rebounds and two assists. For Waynesville, Carli Brown scored 10 points while Rachel Murray had eight points and three rebounds. Marcella Sizer also helped out, scoring four points and grabbing nine rebounds. The No. 7 ranked Titans will get right back at it, traveling to New Boston Monday evening. Notre Dame: 10-37 FG, 3-6 FT, 3-14 3pt. (Cassidy 2), 34 rebounds (Dettwiller 13), 22 turnovers, 6 assists (Smith 2, Hassel 2). Scoring: Hassel 9, Dettwiller 6, Cassidy 6, Hash 4, Smith 2. Waynesville: 11-44 FG, 8-12 FT, 2-17 3pt. (Murray 1, Brown 1), 18 rebounds (Sizer 9), 10 turnovers, 4 assists (Hartshorn 2). Scoring: Brown 10, Butterbaugh 8, Murray 8, Sizer 4, Hartshorn 4.